The first day of the Bney Yosef (Sons of Joseph) National Congress has concluded with great promise. The delegates gathered at Ariel, Israel, among the hills of Samaria, are united in the understanding that the time has come at last for the Lord God to fulfill His promises to restore all of Israel in preparation for Messiah’s coming to establish His throne in Jerusalem. It was my honor and privilege to present the first address to the Congress. This presentation on Israelite identity met with a positive reception from the assembly. I share it here as a glimpse into the matters we are deliberating. By this time I hope that all of us have had our first “moment” here in the Land. You who have enjoyed such an experience know what I mean: it is that instant when you know you are home at last. On Shavuot I had the honor of being present when such a moment came upon one of our brethren at the Kotel (Western Wall) in Jerusalem. Another brother shared his moment at the Har Bracha (Mount Gerizim, the Mount of Blessing; Deuteronomy 11:29, 27:12-13; Joshua 8:33) yesterday. My moment came last week at Caesarea. Allow me to share it with you. My wife and I arrived in the Land one week ago today, on May 19, to stay a few days with Ephraim and Rimona Frank. Soon after we arrived at their home we began to discuss what to do the following day, which would be one of our few opportunities for touring before the Congress. When Ephraim mentioned that Caesarea was not far away, both of us indicated our desire to see it. What drew me there was the connection of Caesarea with the Apostle Paul. If you were here on Shavuot to listen to Frank Houtz teach about Paul’s commission to regather Ephraim, you can understand why I wanted to see a place so important to his ministry. It was in Caesarea that he stood trial before the Roman governors Felix and Festus, and before King Herod Agrippa, and it was from Caesarea that he left on his journey to Rome (Acts 23:23-27:2). All of this I knew, and all of it I wanted to see. What I did not expect was the immense weight of 2,100 years of history that fell on me that day. 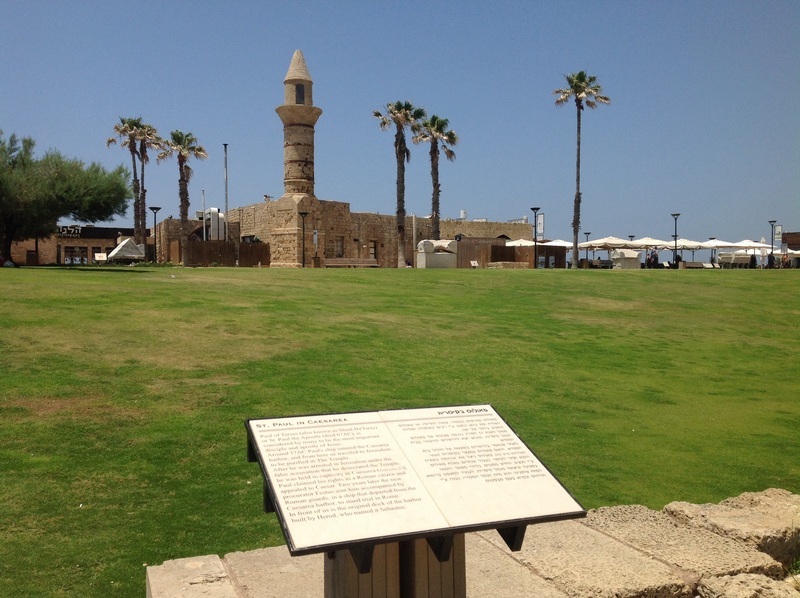 As we walked through the ruins and learned the story of the city, I felt a connection with all the peoples whose stories intersect with Caesarea: Judeans, Romans, Greeks, Byzantines, Muslim Arabs, Christian Crusaders, and Jewish Zionists. All of them made indelible marks on that city and on this Land. Some of those marks have been good, and some very evil. That was the realization that led to my “moment”: the understanding that now it is our turn to join this story. We are very much a part of it, and very much linked to all of those and many others. The question is whether the marks we will make will be for good or for evil. Site of the original harbor at Caesarea. The Apostle Paul departed from here on his voyage to Rome. Let me expand on that point. A very important lesson of my moment at Caesarea is that Ephraim has attempted to return to the Land before. Actually there have been several attempts, starting within a generation of the Assyrian Conquest. None of them achieved any lasting results, except for this one. I am talking about the Crusades. The reason I say it is an Ephraimite attempt at returning to the Land is because the Crusaders were Christians from Europe, the primary destination of the Ephraimite exiles who migrated to the West. Their intent was noble: they wanted to drive the Muslims back from Jerusalem and secure the Holy Land for Christian pilgrims. There was more to it, of course – a host of economic, political, and military incentives that sufficed to mobilize an entire continent against the realm of Islam, and which eventually succeeded in bringing an end to Muslim rule over most of Europe and exporting Christian civilization across the globe. Yet whatever good the Crusades accomplished was tainted with blood from the very beginning: Jewish blood. The First Crusade had not even left Europe in 1096 before the Crusaders started slaughtering Jews. The trend continued in 1099 with the capture of Jerusalem and the massacre of the city’s Jewish and Muslim inhabitants. The violent precedent set by the First Crusade continued through the centuries, bringing such atrocities as the massacre of Jews in York, England, after the Third Crusade, and the expulsion of Jews from Spain after the greatest Crusading victory, the Reconquest of Spain from the Moors in 1492. It is no surprise that our brethren of Judah remember with horror these so-called holy wars. What has compounded the tragedy is that Christians for centuries have upheld the Crusades as an example of pious devotion, and only recently have begun to shun the word “crusade” after a belated recognition of its terrible meaning in the minds of both Jews and Muslims. What is even more tragic is that the Christians who perpetrated the evils of the Crusades had no idea that they, as Israelites, were continuing the war of brother against brother that began long ago with our rebellion against the House of David. Truly Judah had vexed Ephraim, provoking anger and rebellion, but it was Ephraim’s envy that magnified the offense (I Kings 12:1-16). The cycle continued through the ages, bringing painful results such as the poisoned fruit of the Crusades. And the cycle continues to this day, unless we are ready to break it. This is a very long, but necessary, introduction to the subject at hand. My task today is to address this Congress on the subject of our identity as Ephraimites, meaning people of the exiled Northern Kingdom of Israel. Apparently I am now something of an expert on the subject simply because I wrote a book about it. All I have done, brethren, is to stand on the promises of Scripture and see how those promises have been in the process of fulfillment through the ages. Having met with many of my fellow delegates over these last few days in our pre-Congress fellowship, I am persuaded there is little need to cover that subject in great detail. We are here because we now know beyond any doubt that we are Israelites, the “Lost Tribes” of Ephraim returning home at last. Moreover, we are beginning to recognize that, unlike our crusading predecessors, we cannot return in the time and manner of our own choosing, but only with humility in answer to YHVH’s call. Since we know this, all I need do is summarize what has gone before so that we may understand our part in what comes next. What I would like to do is present to you the authority by which we may with confidence affirm our identity as Israelites of the House of Ephraim. Then I would like to present some thoughts about who may be included in this nation, both now and in the future. Finally, I would like to explore some things we might do to build this nation. By what authority do we claim to be the returning tribes of Northern Israel? 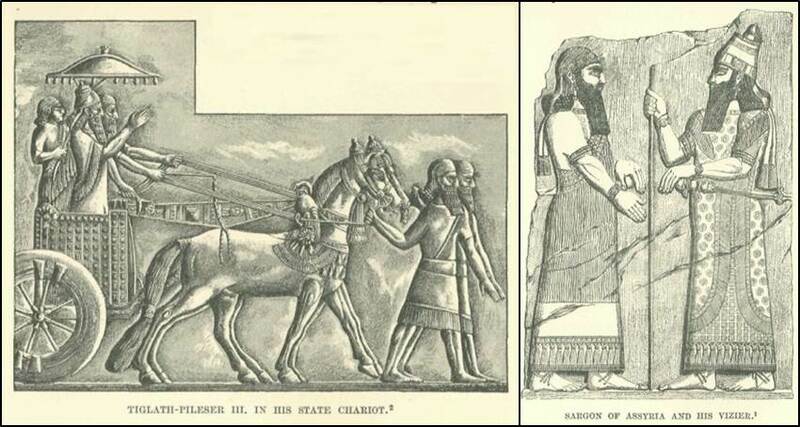 The Assyrian conquest of Israel (Ephraim) began under Tiglath-Pileser III and ended with the destruction of Samaria under Sargon V. Engravings by Henri Faucher-Gudin from a sketch of Tiglath-Pileser III by Eugène Flandin and of Sargon V by Austen Henry Layard, in G. Maspero, History of Egypt, Chaldea, Syria, Babylonia, and Assyria, Vol. VII, Part B. How do we know we are Ephraimites? Or is that even the right term we should use to describe ourselves? It will do for now. By “Ephraimite” I mean a person who can claim to be a non-Jewish Israelite. In time we will refer to ourselves by our tribal identifications, but at the moment it is sufficient to align ourselves with Ephraim, the son of Joseph who inherited the birthright of Abraham, Isaac, and Jacob. We know from Scripture that Ephraim led ten of the tribes of Israel in rebellion against the House of David, leaving King David’s heirs to rule only the tribes of Judah and Benjamin, and a portion of the priestly tribe of Levi. In time remnants of the rebellious tribes did return to the House of David, but most of those remnants returned only after the Assyrian Empire destroyed the Northern Kingdom. In any case, the returnees came back as individuals, not as tribal units, and thus the Ten Tribes of Israel are still the “Lost Tribes” to this day. This redemption and restoration began with the ministry of Yeshua of Nazareth, the person we Ephraimites understand to be Messiah. Yeshua said that He was sent to the lost sheep of the House of Israel (Matthew 10:6, 15:24), so we may infer that at least part of His purpose on this planet was to start the regathering process. That was the understanding of His followers; the last question they asked Him before His ascension was when He would restore the kingdom to Israel (Acts 1:4-6). That they acted on this belief is apparent in the declarations of the Apostles that disciples of Messiah Yeshua are adopted or grafted into the Commonwealth of Israel under the same terms by which Elohim established His covenant with our ancestors at Sinai (Exodus 19:5-6; Romans 9:1-11:36; Ephesians 2:1-22; Galatians 3:15-29; I Peter 2:4-10; Revelation 1:4-8, 5:9-10). We conclude from this that followers of Yeshua are indeed Israelites, something that has been ignored or misunderstood for centuries. The worst of the misunderstanding is in the form of replacement theology, an error we know too well. What we understand now, and are prayerfully attempting to walk out, is the instruction of Scripture that returning Ephraimites and their companions join with the Jewish people (Judah) in the nation of Israel. Ephraimites do not in any way replace the Jews, but come together with them to complete this holy nation. Such is the testimony of Scripture, and that alone is a sufficient basis for our claim of Israelite identity. But the Torah says we need another witness, and for that we turn to History. We know where the Tribes went thanks to the record of Scripture (II Kings 17:6, 18:11; I Chronicles 5:26) and to linguistic, anthropological, genetic (DNA), historical, and religious evidence. The Assyrians exiled them to regions we can identify as northern Iraq, southeastern Turkey, and northern Iran. We can trace the migrations of these peoples north and west across the Caucasus into Europe, east across Iran into Central and South Asia, south into Africa, and even across the seas to the ends of the earth. Those who went west eventually became the European powers which colonized most of the earth and seeded the nations with Israelite stock. Those who went east and south retained vestiges of their Israelite heritage and can be identified among the Kurds of Iraq, Iran and Turkey, the Pashtun of Afghanistan and Pakistan, the Bnei Menashe and Bnei Ephraim in India, the Lemba of southern Africa, and others, including some American Indian nations. The problem with “Lost Tribes” studies, however, is that it has been on the fringe of “respectable” scholarship. This is not to say that such work is without any merit at all, for much of it is commendable. I refer in particular to the work of Yair Davidiy, Steven Collins, Barry Fell, and Alex and Georgina Perdomo, who have all informed my conclusions. They are serious scholars in their various fields, but their work has never been accepted in the academic mainstream. This is not because of a lack of credentials, but rather because their lines of inquiry and their conclusions are not consistent with the accepted story of human development. Even though we may not agree with all their conclusions, they do present arguments that deserve serious consideration. We should not be afraid to study their work, but as with all things we must test it, using that which proves credible, and discarding that which is not. Who can claim Ephraimite/Northern Israelite identity? If the testimony of Scripture and of History indicate that there are people who can claim Israelite identity, what are the criteria for that claim? Who is part of this nation? This is a difficult matter. If we set the standards of “citizenship” too high, then we exclude many who are rightful Ephraimites. On the other hand, if the criteria are too lax, then we have no nation at all. What we can expect is that the Ephraimite nation, like all nations, will evolve as more and more people come to understand their identity. With that in mind, permit me to sketch an outline of national identity. The primary criterion for inclusion in the nation of Israel is covenantal. We are Israelites because God Himself chose to save this nation for His Name’s sake in accordance with the covenant He established with our ancestors, the price of which He paid with Messiah’s blood. We were excluded from the nation because of the sins of our fathers, and we are included in it now only because by the Grace of YHVH we are awakening to those sins and repenting of them. You may ask what this does to the physical element of Ephraimite identity. Is it important? Yes, it is. God scattered our ancestors throughout the nations on purpose, with the intent that they would mix with every tribe and tongue and form a core or cadre within each that could receive the good news of redemption and restoration in Messiah. That is the “leaven of the Kingdom of Heaven” Yeshua spoke about. Today’s returning Ephraimites may well be those whose physical descent is directly traced to the tribes. We cannot say for sure, but we can infer that the physical element is the instrument by which the Holy Spirit has worked to make the nations ready for spiritual regeneration. However, the physical element is secondary to the covenantal element. If we understand Paul correctly, there are both Ephraimites and Jews who are Israelites according to the flesh, but who would be excluded from the nation because they have not followed the Lord in obedience to His Torah. This brings up some delicate questions about “salvation” which I am not prepared to discuss in detail at the moment. Suffice it to say that our task is to obey the instructions given by our God through Moses, the Prophets, and the Apostles. The reason our obedience does any good at all is because of the work of Messiah in paying the price of redemption for our rebellion. I think we can all agree that this is a Messianic task, and that our faith in YHVH to accomplish it is the basis of our obedience to follow His instructions. The real question, then, is whether Yeshua as Messiah has already done this work, or if we are still waiting for Messiah to do it. This is one of the differences between Judah and Ephraim which we will not resolve today, but which hopefully will not keep us from cooperating in God’s work of putting back together the two halves of His nation. In any case, our immediate question is about membership in the Ephraimite part of the nation. It would seem from the testimony of Scripture, and from the personal testimony of us here assembled as Ephraimites, that Messiah Yeshua is the reason for our return to fellowship with our Creator and to His Torah. Thus we may refer to the Apostle John in stating that Ephraimites are those “who keep the commandments [Torah] of God and have the testimony of Yeshua” (Revelation 12:17). So much for the definition of Ephraimites as we currently understand this national identity. But what of others who may be described as “potential” or “latent” Ephraimites? There are three categories that come to mind. The first would be Ephraimite Jews: descendants of the Ten Tribes who joined with Judah, but who do not acknowledge Yeshua as Messiah. I submit that ultimately they must choose which part of the nation is their identity. For now they are part of Judah, and we have no need to change that. The second category are Christians, people who share a testimony of Yeshua (Jesus), but as a rule do not keep Torah (specifically, Shabbat, the Feasts of the Lord, and commandments regarding clean food). Most of us were Christians at one time, and some of us are now going back to our Christian brethren to share what we have learned and seek ways to cooperate with them. We must continue to do so in the expectation that many will in time gain the revelation of Torah’s relevance to them and of their identity in Israel. Although they may oppose us now, Christians are not our enemies, and we must not treat them as such. The third category of “latent” Ephraimites are physical descendants of the Ten Tribes who have no affiliation to Christianity or Judaism. These peoples have links to Israelite ancestry, but they do not acknowledge Yeshua as Messiah or Adonai Elohim as the Holy One of Israel. If they are Muslims, such as the Kurds and Pashtun, we can claim a common identity in Abraham, and that can be the basis of a relationship. Other Ephraimites may be found among Hindus, Buddhists, and other religions. Many, if not most, probably are the people Paul had in mind when he wrote, “for not the hearers of the law are just in the sight of God, but the doers of the law will be justified; for when Gentiles, who do not have the law, by nature do the things in the law, these, although not having the law, are a law to themselves, who show the work of the law written in their hearts, their conscience also bearing witness, and between themselves their thoughts accusing or else excusing them” (‭Romans‬ ‭2‬:‭13-15‬ NKJV). How we work with them is something we must learn as we go, and it is likely that as we reach out in loving works of service, we will see many come into fellowship with our Messiah and into this nation. There are two things we must remember about this Israelite identity. The first is that ultimately it is God Himself Who decides who is an Israelite. It is, after all, His nation. The second is this: Israelite identity is a matter of personal choice. No matter what the pedigree, whether physical or spiritual, unless a man or woman understand their Israelite identity and choose to walk in it, they will never become fully Israelite. 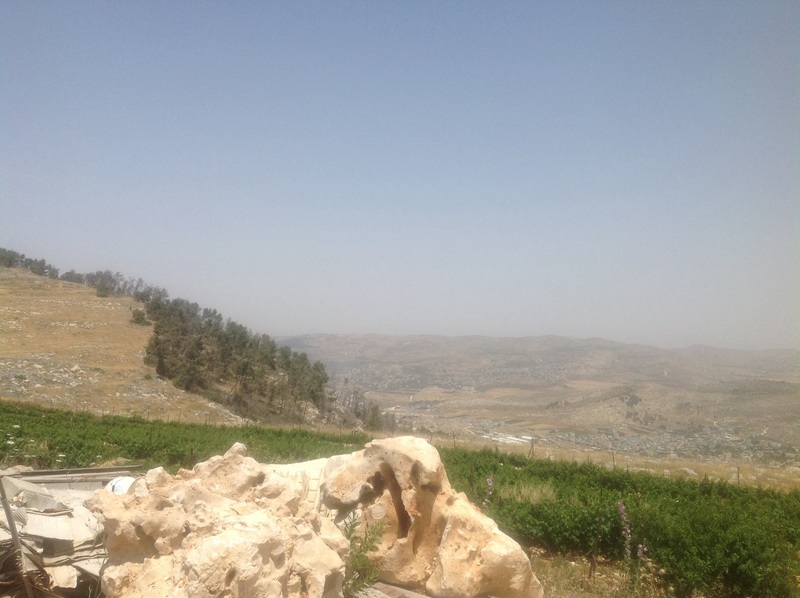 View from Har Bracha (Mount Gerizim, the Mount of Blessing) toward Elon Moreh, the mountain where God promised the land of Israel to Abraham and his seed. The question is actually one of perception and emphasis. On the one hand we are turning from that which we have claimed as our primary source of identity, and on the other hand turning toward a new identity based on the promises of our God. It is not so much a matter of “rejection” of the one as it is an embracing of the other. For example, when my ancestors left Scotland in 1746 to settle in the Americas, they did not cease being Scots. Neither did they become English even though they settled in the “English” colony of North Carolina. They became American Scots. Thirty years later, when war sundered the colonies from England, my ancestors became Americans of Scottish background. They did not reject their Scottish identity, but rather carried it with them into their new identity as Americans. “Scottish” ceased being their primary identification, but it remained a distinctive part of their American identity, even as “Moabite” remained a distinctive part of Ruth’s Israelite identity. We are here because we have made the same choice regarding our Ephraimite identity. We entered this life as German, Swiss, Swedish, Finnish, Welsh, English, Scottish, Irish, Sri Lankan, Indian, Dutch, French, and American, but now we know we are Israelite, and ultimately our citizenship and our residence will be in Israel. Whether that happens within our lifetimes or two generations from now is yet to be seen, but we are confident enough in the promises of our God that we are willing to take great risks of faith on those promises. But what risks are we to take? How are we to build this nation? Let me conclude with some suggestions. Learn Hebrew. We must covenant with one another to become as fluent in this language of our nation as we have been in our birth languages. It will be difficult, but we can expect HaShem to help us just as He promised through the prophet Zephaniah (Zephaniah 3:9). Let us resolve to hold our congresses and conferences in Hebrew at the earliest possible date. Establish local Ephraimite communities. This is something our brother John Conrad and others will address later in the Congress. All I will say here is that we must learn to live together where we are as Torah-keeping Ephraimites, walking out in community the righteous lifestyle we have been studying. Communicate with each other locally, regionally, and globally. Virtual communities already exist thanks to the internet. Let us expand on that by making concerted efforts to broaden and deepen our relationships. Those efforts include travel to other places, even other countries, so that we can learn from one another. What prevents Ephraimite teachers in India or Germany from coming to the US and Canada to share their knowledge? What prevents Ephraimites in North America from doing the same? When we travel, why should we plan to stay for only a week or two? Why not make it an extended stay, even a year or two? That is how we will build this nation on a global scale. Tell others about our Israelite identity. This also is a difficult thing. At the least we will appear foolish to our friend and family, and at worst it will drive a wedge between us and them that could cut us off from their fellowship. Nevertheless, if we truly believe the promises of our King, then we will act on them by sharing this news at every opportunity. Communicate our message through a national media. This already exists in small, uncoordinated ways. There are broadcast outlets like TV7 Israel News in Finland, Hebrew Nation Radio in the US, Hebrew Roots bloggers around the world, and Torah teaching ministries with global reach. It is time to bring these threads together into a coordinated press corps, providing not only Hebraic insights on Scripture, but news about our nation as it develops in the nations of our current exile. Humbly ask Judah for help in understanding Torah. What have the sages been learning all these centuries? What do Yeshiva students learn? How can we as Ephraimites join in this learning so that we may be better prepared to join with Judah in this expanding Ephraimite nation? We should not expect Judah to regard us with any degree of seriousness unless we are willing to listen to him with the respectful attention he deserves. This does not mean we depart from our allegiance to Messiah Yeshua. If Yeshua really did come to teach Torah perfectly, then we should find much in rabbinic learning that can help us understand how He did it and how He walked out what He taught. Humbly offer help to Judah. Take every opportunity to assist the State of Israel and Jews within it and in the diaspora. Jews in France and Ukraine right now need help making Aliyah. It should be Ephraimites leading the way to provide that assistance. As anti-Semitism increases, Ephraimites should be the first to speak out against it, and should not shrink back from assisting Jewish efforts at providing safety and security wherever threats arise. As for help in the Land, we have already heard about opportunities to come to Israel as volunteer workers, and we will hear more. Let us also seek out Israeli products and buy them whenever we can. If we bless Judah just because he is our brother, and not because we seek something in return, then we build trust. In time that will translate into real nation building as one reunited people. Question for you… In your article you suggest we all learn Hebrew. Were you referring to modern Hebrew to speak with each other in Israel and at the Congress or Biblical Hebrew? Give Char a squeeze for me! Scott, Cameron and Isaiah send greetings to you both. Hi Debbie! In this case I mean modern Hebrew, but we do need both. Hugs have been duly distributed. 😉 Greet all your men for us! This is such an inspiration! Hope I can make it to next year’s conference! Say hello to my mom Robin Hardman for me! Thanks! I’ll be sure to tell her “hi” for you. Shalom Cari. Truly great events are upon us. Whether they are these great thingI we have expected for so long is something we will learn as we walk out each day in obedience to YHVH and in expectation that He will do all that He promised. I’m still hoping to get to Israel for Succoth! Sending prayers up for a tremendous, impactful conclusion to the conference today in Israel! What a wonderful word picture you have painted for us in this post, of the purpose and relevance of this first congress. I can almost visualize being there with you all. This is such an inspiring message of hope for those of us who sometimes feel it’s such a big transition from where we have lived all our lives to this new, yet not really new at all, realization that we are Israelites. Thank you for sharing and I look forward to hearing more. Love the to do list at the bottom of the article. I hope to be involved in the process in due time. It has been a wonderful experience, Joyce. We have lots of work ahead of us, and I’m sure there will be plenty for you!